Trailer for upcoming Korean film "V.I.P." 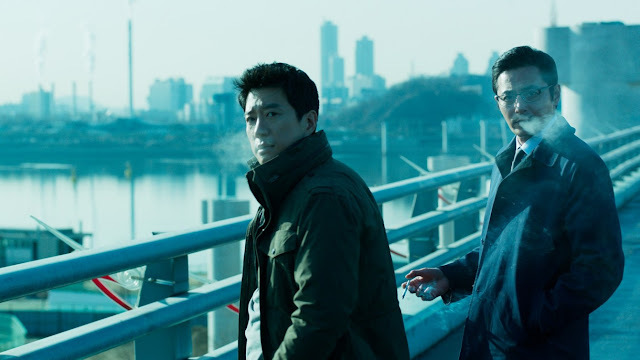 "New World" and "The Tiger" director Park Hoon-Jung returns with a crime thriller that stars Jang Dong-gun (My Way), Kim Myung-min (Deranged), Park Hee-soon (The Suspect) and Lee Jong-suk (The Face Reader). The story follows a North Korean defector, the son of a key political figure, who turns out to be a prime suspect in a series of murders. A national intelligence agent, a detective and a North Korean officer all collide in their attempts to capture him. Park Hoon-Jung Patrick Hofmeister S. Korea Trailers V.I.P. Asian Film Vault: Trailer for upcoming Korean film "V.I.P."